Put everything in a blender and blend until no more bits of spinach leaf are whirling around. 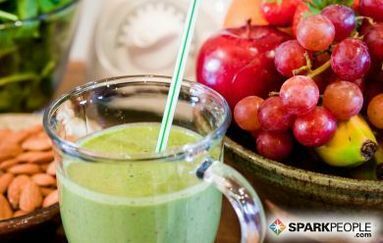 If you want, you can blend the spinach and orange juice together first to make this faster! I like to freeze this in ice-cube trays and dump it in a 'to go' cup for a quick breakfast on the way to work. Recipe submitted by SparkPeople user PESCETARIAN.